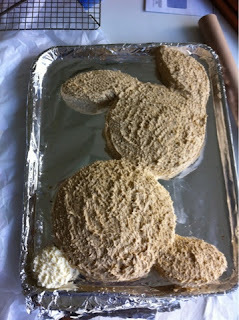 As my nephew turns one at the start of May it was only right that we made him a cake. Fortunately, mu Mum was on hand to help as I'm recovering from some strong IVs so was not up to doing an awful lot of baking. 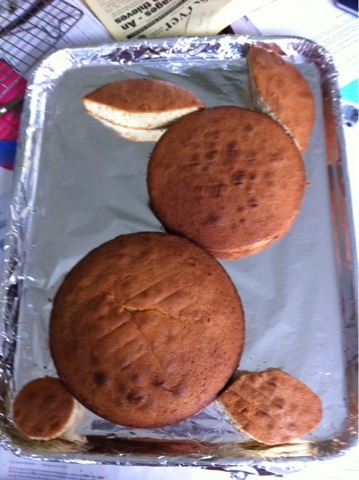 As such, we did the baking of the cakes in the morning, then I had a rest and did the decorating in the afternoon. The idea comes from Mary Berry's Baking Bible- a book full of recipes that I've yet to find a dud in. It's made from three round sponge cakes, one nine inch for the body, one eight inch for the head and another eight inch that is cut up to make the tail, ears and feet. These were then all arranged on a foil covered tray. 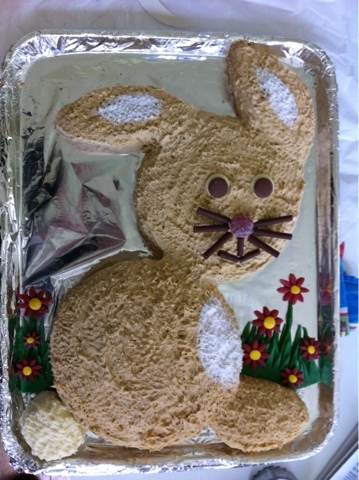 This as then covered with a lot of butter cream- it uses a pound of icing sugar! I left it plain for the tail and managed to make a sort of fawn colour for the fur with food colouring. I fluffed the icing up a little with a fork to look like fur. 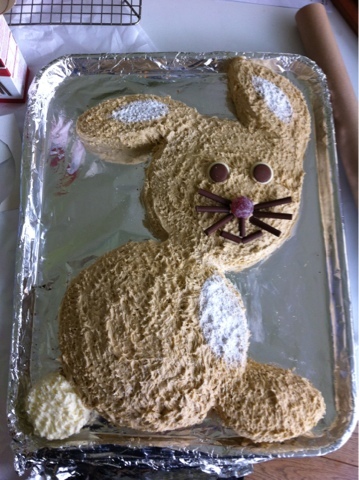 The eyes are made from white and milk chocolate buttons, the nose is a jelly sweet and the whiskers and mouth are chocolate sticks! Because I don't believe in doing anything by half, I finished it off with some grass and flowers made from royal icing. I'm not sure that at only one James will really appreciate it, but Sophie definitely will! Well, I'm back on the 'normal' ivs, dull, dull, dull, but I am not to be hauled into Papworth for three weeks just yet... The consultants have consulted, and decided that at the moment they don't think it's worth subjecting me to the treatment regime for the micro bacterium as they want more evidence that I actually a colonised with it before they do that. Now I am fairly pleased about this, but I am still getting a very large sense of deja vu, as I was told the exact same thing a couple of months ago. However, I subsequently got another positive result and the whole saga started off again, so in this instance I am not holding my breath... It is fairly obvious that this situation could reverse itself as easily as falling off the proverbial log so until I've had a good few more negative cultures I will not be hanging out the bunting and opening the champagne. I've also managed to grow another unheard of bug called Chrysomanes indologenes!!! (no idea if I have spelt that right). It is apparently not something to worry about as it doesn't cause problems, but how on earth do I manage to pick these things up? I'm seriously considering wearing a hazmat suit at all times as I just seem to be collecting weird bugs at a great rate and I am getting a bit fed up with it!